A common vision of the smart home of the future is beginning to emerge. See the figure on the left. The home of the future will have solar panels on the roof and it will be both a producer and consumer of energy. It will have smart appliances. The smart air conditioner/heater and a smart water heater will dominate. These are large thermal loads that can be shifted in time. The home will probably have a battery for energy shifting and reliability. The battery in the homeowner’s electric vehicle will be integrated into the home’s energy managment strategy. The smart appliances will be coordinated by an energy management system (EMS.) We are seeing the impressive capabilities of these systems in products like the Nest Thermostat. The home will have a meter capable of measuring and reporting energy flows as a function of time. 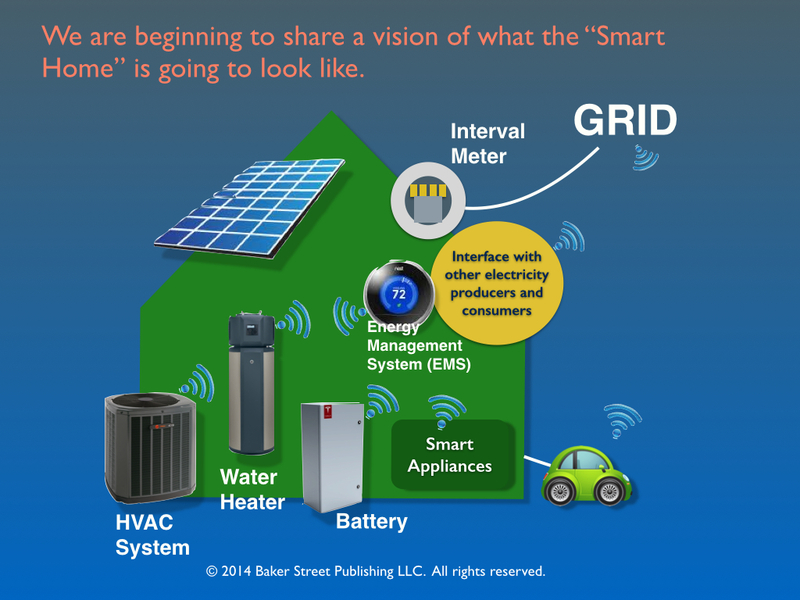 Virtually all homes will have “smart” meters. We can be confident that this is where things are going. It is just a matter of time. The technology is available and costs are decreasing rapidly. This vision of the future has everything going for it: efficiency, cost reduction, fossil fuel reduction, comfort and convenience. The major holdback is the ability of the smart home to get valid, sophisticated prices from our electricity business and regulatory model. The big uncertainty about the future is not about the customer. The big question is, “Which business and regulatory model will we choose?” Will we continue to patch up the current system? The current model is command and control. The model uses antiquated resource optimization methodologies to guide investment and operating decisions. The model strives to minimize costs and to recover investments in central generation, transmission, and distribution from customers. Virtually all risk is shifted to the customer through a system of long-term contracts that favor producers. Economic principles are used by regulators in a highly-politicized process to allocate operating costs such as fuel and maintenance. Complex tariffs (price schedules) are designed to meet business and regulatory mandates. As the electric energy ecosystem gets more complicated the current cost-of-service model is struggling to keep up. Regulators are patching together tariffs that are more time and location sensitive. Some attempts are being made to unbundle energy and transport costs. Solar panel treatment is an example of how difficult it is to design electricity rates that are efficient, fair, and transparent. California worked for many years to develop a Net Metering concept in a politicized process. Net Metering was implemented in the last 12 months. Now new legislation is calling for its its review and modification. Technology is causing major disruptions. Solar and wind generation, distributed generation, the electric vehicle, and battery storage are evolving rapidly. We are just seeing a glimpse of what is coming. What are we going to do when the electric vehicle is a major player and we have large amounts of mobile storage capability? How will we decide whether it is better to build central solar generation in the remote desert or encourage rooftop solar? How will customers manage the risk associated with new technology? 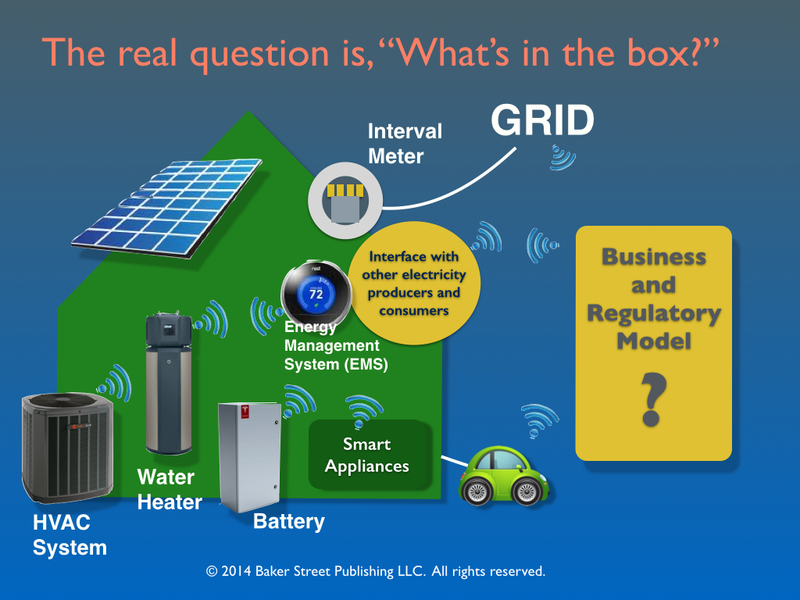 How will homeowners decide how to operate their smart appliances? How will the owners of storage devices make operating decisions? 2) Forward transactions are used to coordinate customer and producer investments and to manage risk. 3) Spot transactions are used to coordinate customer and producer operating decisions. 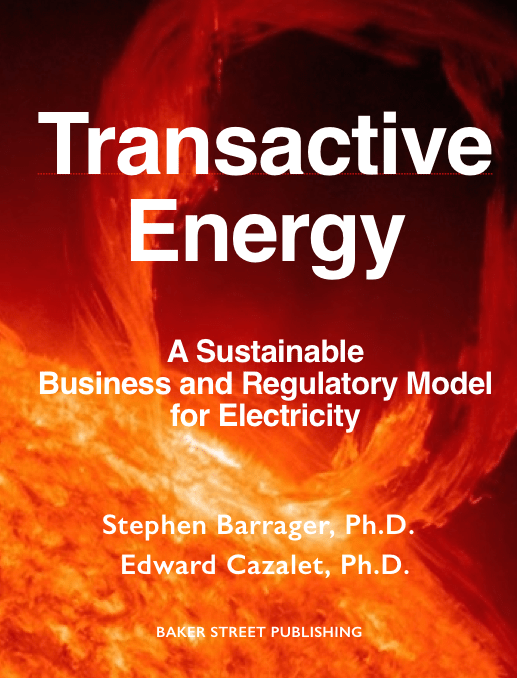 The TE business model is explained in detail in a new iBook, “Transactive Energy: A Sustainable Business and Regulatory Model for Electricity.” The book is available from iTunes as an iBook. It is available from Amazon for the Kindle. 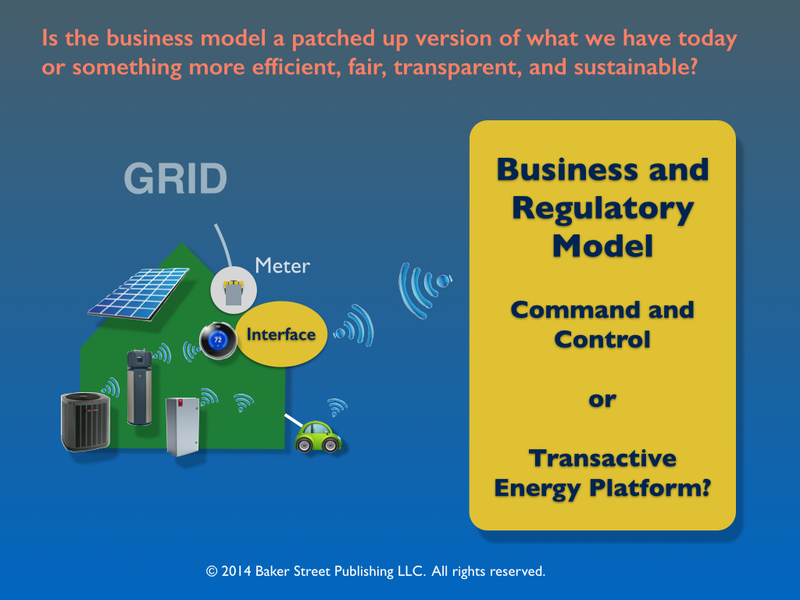 Evolution toward the Transactive Energy model will increase efficiency and stimulate innovation. The model is more fair and transparent than our current regulated cost-of-service, central-resource-optimization model. We look forward to your reviews. If you would like to receive more posts from Baker Street about the Transactive Energy business model by e-mail, just submit your address here.